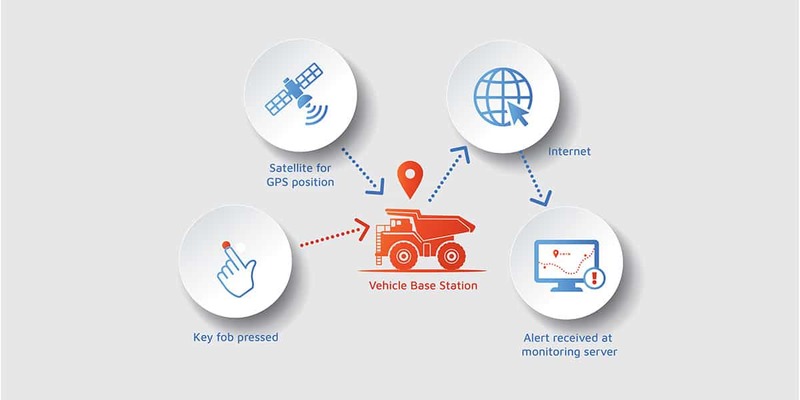 The Step Global Plus Duress range of GPS tracking solutions connect via digital input to any Automatic Vehicle Location (AVL) unit. Using high precision GPS antennas, it’s ideal for new and existing installed tracking systems where a more customised solution is required to facilitate GPS fleet tracking, with the added lone worker features for challenging environments. Plus Duress allows a fleet manager to meet the positioning needs of their fleet, without the expense and delay of new or replacement system installs. The Plus Duress GPS system add-on is a low cost wireless remote system that provides personal emergency alerting for people in a variety of workplace environments including remote or isolated areas. The Plus Iridium® GPS Satellite solution is a low cost wireless remote system that provides personal emergency alerting for people in a variety of workplace environments where backup satellite coverage is required. The Step Global Plus Reckoning GPS tracking system uses dead reckoning to estimate position based on heading and distance travelled since the last known GPS position. Using an equipment GPS tracker, it provides accurate positioning data in environments where GPS signals are lost or severely degraded such as deep urban canyons, dense forests, tunnels, parking garages. The Plus Reckoning GPS solution is a low cost wireless remote system that provides personal emergency alerting for people in a variety of workplace environments where all GPS signals are not reliable or unavailable, and where satellite communication is not used.